I have lived my life wondering what my “purpose in life” is. I know I’m not alone in this. I think it is something most of us wonder about. It seems to be that ever elusive question, “What is the purpose of life?” I have spent years chasing my tail, running after this and that wondering if “it” was my purpose, only to be left discouraged and frustrated in the end. So, What is our purpose in life? Our one purpose as humans is to have a relationship with our Savior, Jesus Christ. God does not want any to perish but to repent (2 Peter 3:9) and accept Jesus as the ONE and ONLY Savior. When we accept Jesus as our Savior and make the decision to live for Him, we are given one further purpose: to make disciples. We read in Luke 19:10 that Jesus came to seek and save the lost and we are here for the same reason. We are here to share the Gospel of Jesus, make disciples, and teach new disciples to obey everything that Jesus commanded us. This is it. This is our purpose. We now know what our purpose is. Next, we need to figure out how we are going to live that out in our daily lives. That is our call. Some people are called to full-time ministry and some people are called to secular jobs. We are all called to different types of work based on our spiritual gifts and skills. God has a place for each one of us. He calls us to different jobs and places so that ALL people will have a chance to hear the Word and accept Jesus as their Savior. 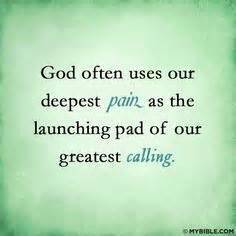 There are many times when God calls us to minister to others from our pain. If we have struggled with grief, poverty, a divorce, etc. God can call us from our pain and use that pain to bring others to Him. We have to be willing to let Him. We have to be willing to step outside of ourselves and trust God to take our pain and transform hearts through our obedience. I also believe that our calling changes, as the seasons in our life change. As we grow and mature in Jesus, He calls us to different jobs and different places. What we were called to in our twenties, may not be what we are called to in our forties. Life has a way of changing us. And then there are those who have felt for a lifetime that they are working outside of their calling. That would be me. Working menial jobs, knowing that I was called to full-time ministry. Why would God give me this burning desire in my heart and never open a door to full-time ministry? I believe He is molding my character. He is teaching me to bloom where I am planted. Even if you work at McDonalds for now, allow God to use you to make disciples of those around you. You may be waiting (patiently or impatiently) for God to open a door to full-time ministry, but be faithful where you are now. Share the Gospel of Jesus where you are now and I guarantee that God will open the door in HIS timing. I know how hard it is. I’m still waiting. I faithfully write this blog. I love writing this blog. This is probably the one thing that gets me through the days I have to work. I try to be patient and I use the time to grow ever closer to my loving God, because I trust that one day He will open a door to full-time ministry with single moms. We have ONE purpose: to make disciples. If you are living out your God-given calling, that is AWESOME! If you are working a job that you are merely existing at, waiting for that door to open, don’t give up! If you know what your calling is and are just waiting for an open door, use this waiting time to prepare yourself. Do your research on the field. Dig into the Word and pray, pray, pray. Don’t forget to use this time to make disciples where you are. Even if we aren’t living in our calling, God expects us to bloom where we are planted and that includes making disciples where we are. When I start a blog post, I am never really sure where it is going to go. I start writing what God puts on my heart and let Him take over. Usually, what comes out teaches me more than anything. I am sitting here with tears in my eyes, because I now get what God has been trying to tell me. In my obedience I gain wisdom. Don’t you love how that works! I hope that in some small way, I have helped you gain perspective on why God does what He does. If you have any questions on your God-given call or need prayer to get through the waiting period, I am always here. fill out the contact form on my contact page or leave me a comment below. Just know that God has NOT abandoned you in this waiting time. He is simply molding you into the vessel He can use for something bigger. Be obedient in this time and He WILL open the door to your heart’s desire.